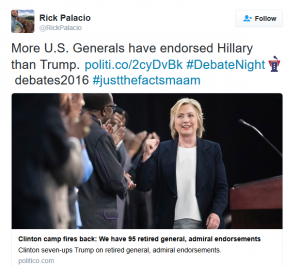 In his excitement during last night’s debate, Colorado Democrat Chair Rick Palacio got out over his skis a bit, boasting that Hillary Clinton has more flag officer endorsements. Just one problem – he was wrong. Palacio’s source was weeks old, and Donald Trump has long since passed Clinton in the number of retired generals and admirals that are lined up behind his campaign. On September 16, Donald Trump came out with a list of 165 retired generals and admirals in his camp, way more than the 95 the Clinton had at her last report. Trump lit up Hilary Clinton in last night’s debate regarding the lack of law enforcement and military support for her candidacy. In a blistering volley, Trump announced that he would rather have military and law enforcement support “over the political hacks that I see that have led our country so brilliantly over the last 10 years with their knowledge.” We assume that was sarcasm. Trump followed it up with an announcement that he will publish a list next week showing the support of more than 200 flag officers. Stay tuned! Members of the military are not stupid. They recognize that Clinton left people on the battlefield before and could do it again. Trump overwhelmingly has the support of the military and veterans here in Colorado, which could spell big trouble for Clinton’s campaign. Palacio is fooling himself and his followers if he thinks that Clinton has a snowball’s chance in hell of capturing the majority of military support. But if Democrats will lie to the American public, we suppose they might lie to themselves, too.